HONEY AND HEMLOCK: The Easter Sunday When Greeks Asked "How is Lord Byron?" Before Saying "Christ is Risen!" The Easter Sunday When Greeks Asked "How is Lord Byron?" Before Saying "Christ is Risen!" Lord Byron in Greek/Albanian dress painted by Thomas Phillips in 1835. 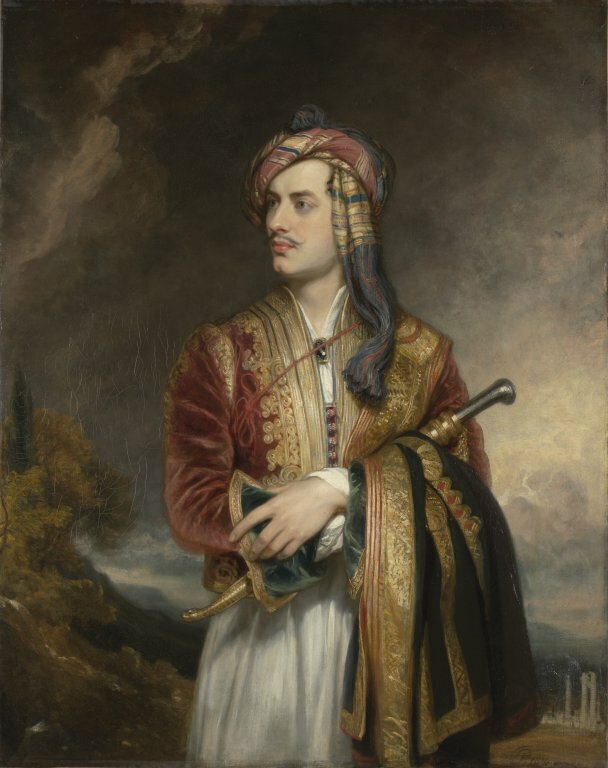 The Philhellene Lord Byron arrived in Missolonghi, Greece on 5 January 1824. Though a wealthy and renowned celebrity at only 35 years old, he gave it all up to help the Greek cause of liberation from the Turks, and his bravery and sacrifice was admired by all. It was not long before his life came to an end however. On 9 April that same year, having been soaked by a heavy rain while out riding his horse, Byron suffered fever and rheumatic pains. By the twelfth he was seriously ill. Repeated bleedings, which he initially resisted, further debilitated him. On Easter Sunday, he entered a comatose state at 11pm. 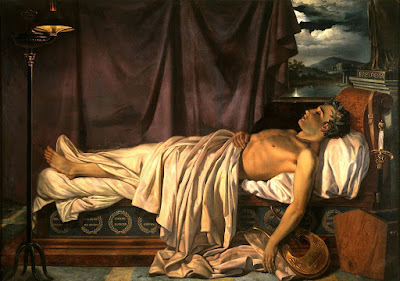 At six o’clock on the evening of Easter Monday, 19 April 1824, during a violent electrical storm, Byron died, being 36 years old. The Lord Noel Byron departed this life at eleven o’clock last night, after an illness of ten days. His death was caused by an inflammatory fever. Such was the effect of his Lordship’s illness on the public mind, that all classes had forgotten their usual recreations of Easter, even before the afflicting event was apprehended. It was further decreed that all public offices and shops were to remain closed for three days, and all Easter festivities suspended. A general mourning was observed for 21 days, and "prayers and a funeral service are to be offered up in all the churches." In memorial services throughout the country, he was proclaimed a national hero of Greece. His death proved effective in uniting Greece against the enemy and in eliciting support for its struggle from all parts of the civilized world. In October 1827 British, French, and Russian forces destroyed the Turkish and Egyptian fleets at Navarino, assuring Greek independence, which was acknowledged by the sultan in 1829. It has been said that if Byron had lived and had gone on to defeat the Ottomans, he might have been declared King of Greece. Byron’s body arrived in England on 29 June, and for two days lay in state in a house on Great George Street, London. On Friday, 16 July 1824, Lord Byron was buried in the family vault beneath the chancel of Hucknall Torkard Church near Newstead Abbey. British historian David Brewer wrote: "Despite the critics, Byron is primarily remembered with admiration as a poet of genius, with something approaching veneration as a symbol of high ideals, and with great affection as a man: for his courage and his ironic slant on life, for his generosity to the grandest of causes and to the humblest of individuals, for the constant interplay of judgement and sympathy. In Greece he is still revered as no other foreigner, and as very few Greeks are, and like a Homeric hero he is accorded an honorific standard epithet, megalos kai kalos, a great and good man."